Trail Monitors (for the benefit of the birds and the people who enjoy them!). safety of YOUR Cavity-nesters in mind! snakes, raccoons and other predators. available for other pole types. 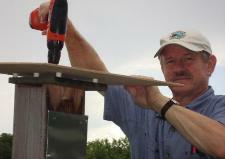 The Birds-I-View "Heavy Duty Trail Box"
Evolution of a Bluebird Feeder! 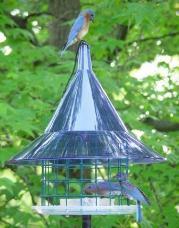 "Suet Log Bird Feeder Kit"! at the 2013 Missouri Bluebird conference. The Birds-I-View "Little Bird Nest Box"
"BIV Little Bird Nest Box". 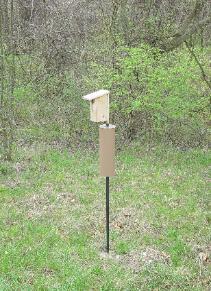 This nest box is perfect for Chickadees, Wrens, Titmice, Nuthatches and more! they'll enjoy USING for years to come! SAVE! 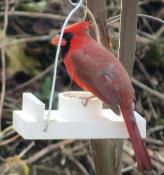 Receive BOTH the Little Bird Combo Kit and the BIV Suet Log Feeder Kit! 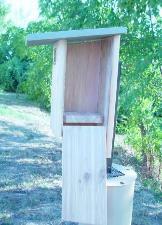 You will have a Fly-Thru Feeder which converts to a Nest Box in the nesting season, and a Suet Log feeder for all year long!